Pick Analysis: One of the better players coming out of the Chicago area in 2011, Golladay ended up at North Dakota to start his college career. He was an often-targeted reserve as a true freshman there (30-429, one TD) and then an honorable mention All-Big Sky pick in 2013 as UND's leading receiver (69-884, eight TD). The head coach was fired after that season, however, so Golladay moved back home to play for Northern Illinois. He sat out the 2014 season as a transfer redshirt, then stepped into the line-up without any fears of moving up a level of football. He was a second-team All-MAC pick with 73 catches for 1,129 yards and 10 touchdowns. Golladay was a first-team selection in 2016, picking up his second 1,000-yard season (1,156) and eight scores on 87 receptions. 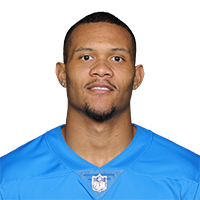 Published: April 28, 2017 at 11:22 p.m.
Detroit Lions safety Don Carey announces the Lions' selection of Northern Illinois wide receiver Kenny Golladay in Round 3 with the No. 96 overall pick in the 2017 NFL Draft. Published: April 12, 2017 at 05:58 p.m.
Everything you need to know about Northern Illinois wide receiver Kenny Golladay. Published: April 4, 2017 at 04:59 p.m.
Northern Illinois wide receiver Kenny Golladay goes through drills at the 2017 NFL Scouting Combine.